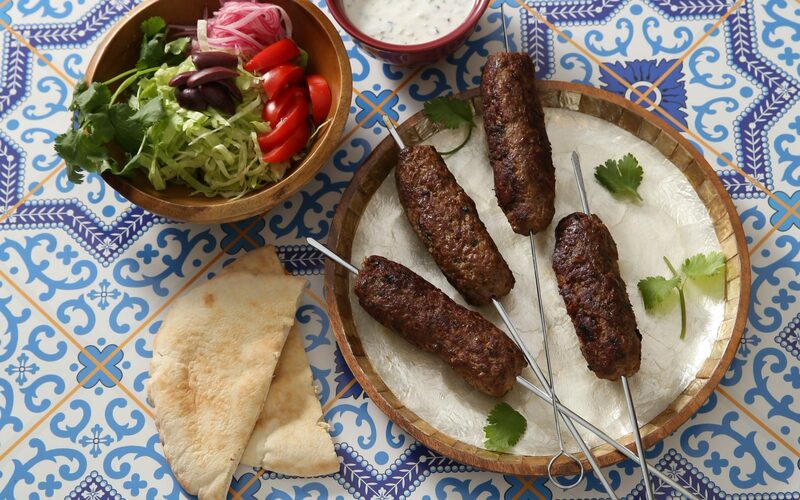 Made from ground meat and spices (traditionally lamb, beef or a mixture of both) Kofta is widely eaten throughout North Africa, the Middle East, central Asia and India. Most commonly it will be found as meatballs simmered in sauce or a skinless “sausage” formed around a skewer and grilled. Miniature versions make great appetizers and larger ones are a fun, interactive build-your-own entree for families and friends. Place the ground meat in a bowl with all the other kofta ingredients. Using your hands, mix together until well incorporated. Separate the mixture into eight equal portions on a tray. Form each portion around a skewer like a long skinless sausage. Place formed koftas in the fridge to set the meat. Mix together the tzatziki ingredients. When ready to serve, season the kofta with salt and grill to your desired temperature, as you would a hamburger. Meanwhile, lightly oil or butter the pita, and grill until warm and grill marks appear. Arrange the pita on a platter with the tzatziki, lettuce, cucumber, tomato and olives. Add the cooked kofta to the platter and serve immediately. Spread some tzatziki on the pita, place a kofta in the middle and top with desired garnishes. Fold in half and enjoy.